This Vision arises directly from the Call and Gospel Values statement adopted by the 28th Synod in May 2010. As the Uniting Church in Queensland sharing in God’s mission in the world, we will be guided by values that derive from and give expression to God’s reconciling action in Jesus Christ. These gospel values will inform our lives as individuals and as the community of the Uniting Church in Queensland. as the church grows, transitions and innovates. 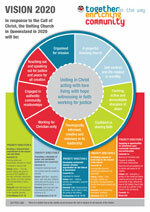 Download the PowerPoint which details the full priorities and read the session report on JourneyOnline. At the 31st Queensland Synod (October 2014) an exciting Open Space process enabled Synod members to reflect on priorities for our church at this time. Collectively, Synod members identified these eight areas as being of highest importance in discerning and responding to God’s call to us. Read the details of these priorities and the session report on JourneyOnline. Enabling a demonstrated commitment to the shared call and vision. Promoting a discipline of prayer and spirituality (individual and corporate). Developing sustainable mission oriented organisation (way of being) for the Church in Queensland. Facilitating renewal of leadership for the mission of the Church. Engaging in intentional, open community connections and partnerships. At the August 2011 meeting of the Queensland Synod Standing Committee, reports were tabled about the priority directions identified in response to the Together on the Way, Enriching Community call, vision and values. 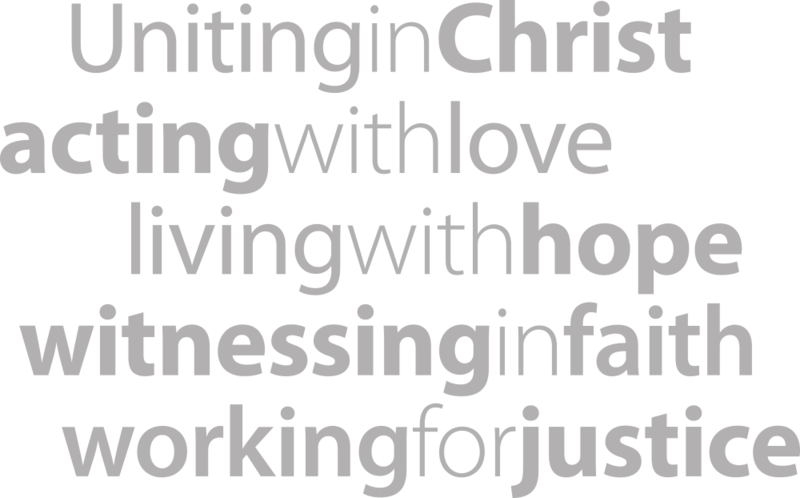 These reports, presented by the five focus groups, identify the rationale, challenges, specific objectives and the recommended steps for working towards the desired outcomes that will enable the Uniting Church in Queensland to fulfil its call: Uniting in Christ: acting with love, living with hope, witnessing in faith, working for justice. Side by Side is a study resource around the Together on the way, enriching community journey and is based around 1 Corinthians 12:12-31 (One Body with Many Parts). It also incorporates reflections on the Uniting Church in Australia’s 1977 Statement to the Nation and includes multimedia resources to assist the studies. It is a project stemming from Priority Direction A (“Enabling a demonstrated commitment to the shared Call and Vision”). Side by Side video 3: What does latte have to do with the body of Christ?